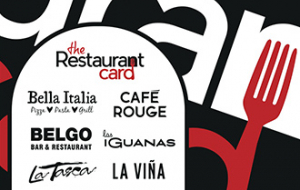 The Restaurant Card gives the choice and flexibility of being able to redeem the card at over 250 restaurants across different, famous brands including: Belgo, Bella Italia, Cafe Rouge, Las Iguanas, La Tasca and la Vina. Codes can only be redeemed in-store please present to the cashier as part or full payment. The value on the code can be used as full or part payment at Cafe Rouge, Bella Italia, La Tasca, Las Iguanas, La Viña and Belgo restaurants in England, Scotland & Wales. The monies on this code cannot be exchanged for cash. Any remaining balance will be stored on the code and may be used for future purchases. All monies on the code must be used by the expiry date, which is 24 months from the date the card had funds applied to it, or the date it was last spent. Any balance left on the code after 24 months of not being used will be deducted. You should treat this code as cash, it cannot be replaced if lost. This code is not a credit, debit or cheque guarantee card. CDG reserves the right to amend these terms and conditions at any time.